902 Davie is a new condo development in the West End of Vancouver. Reliance properties has plans to build a 30 storey micro condo development. The units are proposed to be between 175-275 square feet. Although the development is still in the early stages little information is available at this point. The building will have outdoor gardens every several floors and a proposed grocery store on the ground floor between 20,000 and 35,000 square feet. Although it is pictured to be a Whole Foods it has not yet been confirmed. 902 Davie Street micro condo living. It will be the second micro condo development from Reliance Properties who were responsible for transforming an older building in the Gastown district recently. 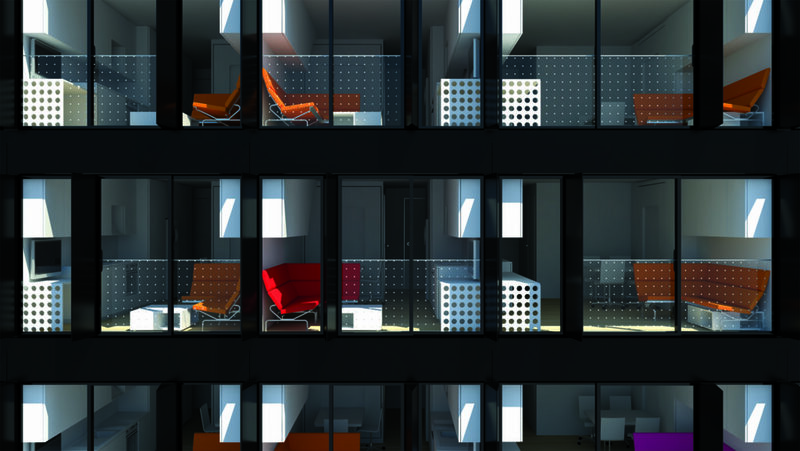 Los Angeles-based Neil M. Denari Architects (NMDA) is responsible for the tower’s design of a bold, black ‘bee hive’ that highlight the perimeter dimensions of each micro-condo unit. It could provide an alternative to unaffordable living in the Downtown area at the expense of traditional square footage found in most condo developments.